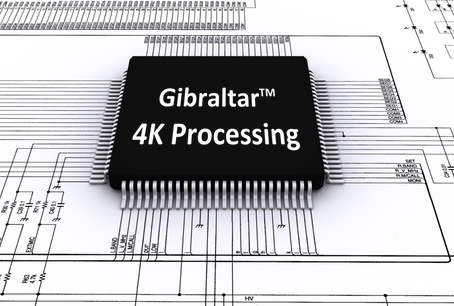 Home /Blog /Gibraltar™ 4K Formatter Hardware Reference Design Now Available! Announcing the Gibraltar™ 4K Formatter Hardware Reference Design from Brass Roots Technologies! The advanced hardware design unlocks the full bandwidth and performance potential from native 4K DMDs (1.38") from Texas Instruments Incorporated. With integrated high-speed Xilinx™ Kintex®-7 FPGA and DDR3 memory, the hardware design fully leverages Brass Roots Technologies' high-bandwidth Gibraltar™ Processing architecture to convert video and graphics input data into high fidelity, floating point multi-toned PWM bit-planes at full DMD bandwidth. A distinguishing feature of the hardware reference design is a multi-channel high-speed SerDes data and control interface. A wide range of input data formats are flexibly supported with firmware reconfiguration of the SerDes receivers. The Gibraltar™ 4K Formatter Hardware Reference Design from Brass Roots Technologies is the ideal starting point for specialized display and imaging applications using the largest and highest native resolution DMD made by TI. Please Contact Us to learn more.